It was Friedrich Nietzsche who said, 'What does not kill me makes me stronger.' If the German philosopher was right, Eric Lamaze might be described as one of the world's strongest athletes. It was Friedrich Nietzsche who said, "What does not kill me makes me stronger." If the German philosopher was right, Eric Lamaze might be described as one of the world’s strongest athletes. The kind of strength built on a career and a life fraught with challenges that more than once had him on a ride to self-destruction. For most Canadians, Lamaze is better known for his faults away from the show jumping ring than the faults he compiles in it. 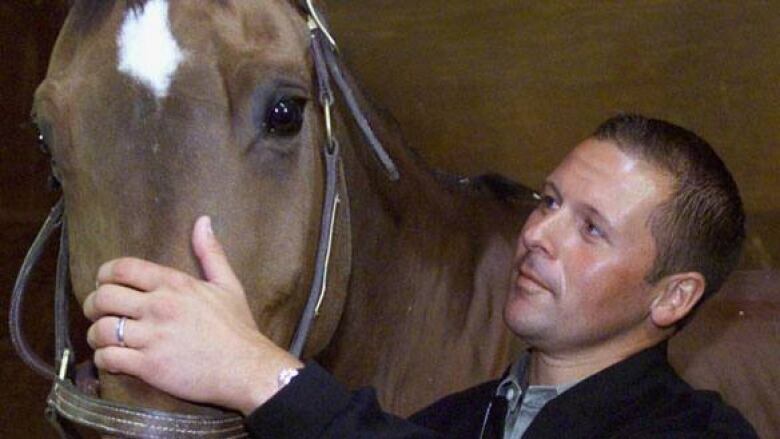 But after more than a decade marked by turmoil, embarrassment and shame, Lamaze not only ranks among the world’s best equestrians, he stands a good chance of bringing Canada its first individual Olympic medal in the sport since fellow Quebecer Michel Vaillancourt in 1976. Still, the mere mention of his name would likely evoke responses ranging from "druggie" to "spoiled brat." Lamaze’s woes began prior to the 1996 Games in Atlanta when a drugs test turned up cocaine. He lost his place on the Canadian team going to Atlanta and received a four-year suspension, the penalty in those days. He was reinstated later that year when an arbitrator ruled that Lamaze’s personal story of growing up with a drug-dealing mother in Montreal and his emergence as a bright riding prospect mitigated the error of his ways…falling off the wagon at a party to celebrate his Olympic opportunity. That compassionate response was reflected in the show jumping community as well. Fellow riders, grooms and horse owners were willing to give him a second chance. He re-built his career, continued his climb up the rankings and by 2000 was once again about to be a key member of Canada’s Olympic equestrian team. Then like a bad re-run, the country watched drugs undo his dream for the second time in four years. In a bizarre turn of events that summer, Lamaze was informed he’d failed another drugs test, this time for a banned stimulant. That meant a lifetime ban from the sport that had saved his life and it sent him down a path of despair. He contemplated suicide. The night he learned of his positive test, he joined his girlfriend at a party during a competition and while drunk and despondent, he smoked a cigarette laced with cocaine. Then, 48 hours later, the test result was expunged on appeal. However, that 1996 positive test made Lamaze a targeted athlete and a doping official showed up at his house a few days after the party. Incredibly, after learning he’d won his case, he was facing another hearing when news came that he’d tested positive for cocaine, again. That lifetime ban was back on the table when his new appeal went before the same arbitrator who’d ruled in Lamaze’s favour before. Once again, law professor Ed Ratushny accepted the rider’s story and overturned the suspension days prior to the Sydney Games in 2000. It didn’t much matter as the Canadian Olympic Committee decided to keep Lamaze off the team and the national media roasted him as a two-time cheater. That was almost eight years ago. In 2007, Lamaze became the first Canadian rider in 20 years to crack the top 10 in the world rankings and was the first North American rider to win more than a million dollars in prize money in one year. Almost a third of that came on one day last September when he captured the CN International, the richest single event in the sport. And he did it at Spruce Meadow, the place that once nurtured his burgeoning talent but had wanted to keep him out after his second test in 2000. As Lamaze told me in a rare interview last fall, "Even those people that wish I was under the ground and never came back are finding some passion in their heart and saying, ‘Wow, this is something!’"
Aboard his brilliant mount "Hickstead," perhaps Canada’s greatest jumper since "Big Ben," Lamaze finally is going to the Olympics. Though he’s not comfortable talking about his past, he realizes that he’s going to be asked about it in the months leading up to the competition in Hong Kong. In our interview, he said he wasn’t sure if Canadians would ever forgive him for his past transgressions. But he hoped that making the Olympic team might go a long way to healing the scars, both his and the country’s. "The years of recovery from that, and trying to feel that you're doing enough to pay people back for the mistake that you made in the sport, takes a very long time." Lamaze told me, "Every day I feel that it doesn't matter if I win or what I do. I feel like I'm paying people back you know and the Olympics I guess will be the final payoff, the last of the loan so to speak." At 39, Eric Lamaze knows he has his faults, knows he’s not perfect. He also knows that in show jumping, you don’t have to be perfect, that the rider with the fewest faults usually wins.